Elvis the dog passed away this morning. It was rather sudden and unexpected. He will be missed tremendously by all that knew him. I have many, many fond memories of Elvis. He was a very gentle, kind, obedient, and probably the most loyal dog I’ve ever had the pleasure of knowing. His loyalty to my brother Frank was absolute and never wavered through the highs and lows of his life. I’ll never forget just how tiny Elvis was when we picked up from the Philadelphia Airport. 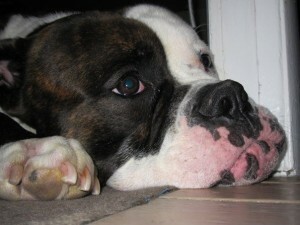 Though he’d grow up to be quite a large American Bulldog, he was barely larger than a shoe when we first met. I took him out of his little crate in the car and he just slept by my feet the whole ride home. His gentle behavior wasn’t just in that first car ride, but would persist for the entirety of his life. He was just a calm guy, who rarely if ever got himself into any trouble. He never ever took a piece of food that wasn’t given to him, he’d always make sure it was alright for him to do so first. What would probably stand out to most were his looks. He had the American Bulldog face that was both gross and slobbery yet very handsome at the same time. He was instantly liked by all. He really didn’t bark too much until later in life (and when he did bark it was almost guaranteed that it was at nothing), but would communicate with whines and cries. He was easily the biggest baby I’d ever known. Scared of his own shadow, yet could pull a hole through a wall if he got too excited and misjudged his speed while turning a corner. He loved his stuffed animal toys and would carry them with him at all times. Rarely could he be found without a stuffed animal nearby, even well into adulthood. Elvis made it through two major knee surgeries a few years back. While by no means an ideal patient, he did eventually make an excellent recovery and we were all glad that he could resume his regular dog duties (sleeping, drooling, etc.). He wasn’t much of a licker, which was fantastic considering how dirty his jowls were. Always full of slobber, a shake of his head was known to send it several feet and landing quite high up on walls. So high in fact it was difficult to fathom at times. He was so filthy and stinky, but so likable that it didn’t matter. Becoming drenched in slobber was easily worth the risk of getting close to such a fine dog. I spent many hours protecting him from thunderstorms, lighting, stressful situations, etc. He would just sit pretty much on top of my feet (not that comfy for me) and I’d pet him until we rode out whatever scary situation was affecting him. Our walks around Linwood were always a pleasure. While he was known to want to call it quits after only a block on many occasions, we did get around 2 miles or so for a bit. He always attracted quite the audience, with people constantly stopping to ask more about him, or waving from their cars at him. He was quite the popular walker. I have so many great and wonderful memories of Elvis the Dog. While my family and I will be deeply saddened by his loss, I do know that we gave him the best life we possibly could and that he knew that. He was so happy to be a part of our family and to look after and protect my brother Frank while he was with us. He will be missed a great deal.